Perennial herb 0.5 - 1.5 m tall Stem: erect, unbranched, stout, usually hairless, but possibly sparsely short-hairy on angles. Leaves: alternate, stalkless, toothed, 8 - 12 cm long, over 1 cm wide, oblong or elliptic, typically broadest at or above middle and narrowed at both ends. The upper surface of the leaves, especially at the edges, is covered with appressed, forward pointing hairs (i.e. toward leaf tip). Inflorescence: a single, terminal, erect, densely crowded, 10 - 50 cm tall, leafy-bracted, spike-like cluster of more than twenty flowers, each on ascending, hairless, 4 - 10 mm long stalks in axils of obvious, up to 5 cm long, leaf-like bracts. Aside from the large subtending leaf-like bracts (largest below, reduced in size upwards), each flower stalk has two, tiny, nub-like bracts (bracteoles) at or above its middle. Flowers: bright blue (sometimes white), 1.5 - 3 cm long, bilaterally symmetric, with two-lobed upper lip and three-lobed lower lip. The flowers are actually flipped upside down so that the morphologic upper lip (of three spreading lobes) appears on the bottom of the flower, and the two erect lobes at the top of the flower are actually the morphologic lower lip. Sepals: bristly-hairy, five, but fused at base into short cup-like tube, then separating into five, large (0.8 - 1.2 cm long), egg- or lance-shaped lobes with prominent, 2 - 5 mm long, ear-like appendages (auricles) between lobe bases. Petals: five, but fused for half or more their length into a straight tube with slits on each side near base, then separating into two lips with two flaring but erect lobes above, and three larger, downward pointing, spreading to almost parallel lobes below. All five petal lobes are somewhat lance-shaped (widely so in lower three) and obviously hairy at the tips, but the two-lobed "upper" lip (morphologic lower) has no beard of hairs near its base, while the "lower" lip (morphologic upper) has two central white projections (almost ridge-like bumps) near the base of the three lobes. Stamens: five, but fused into a 1.6 - 2 cm long tube with two anthers bearded at tip and shorter than the other three. Pistil: with a two-chambered, inferior ovary; one long style positioned through center of stamen tube; and a two-lobed, often fringed stigma. As the style elongates up through the stamen tube, it pushes the pollen out of the anthers. Fruit: numerous, two-chambered, many-seeded capsules, which open at top. Similar species: Without a flowering shoot, Lobelia siphilitica can resemble L. cardinalis since both grow in similar habitats. However, the leaves of L. cardinalis are broadest below the middle and hairless to thinly hairy above (but then with ascending hairs in no particular orientation). When in flower, the two species are unmistakable since Lobelia siphilitica has blue or white flowers, and L. cardinalis has bright red flowers. 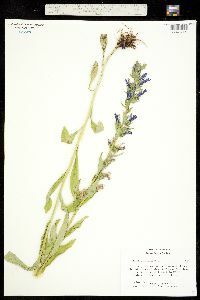 Lobelia siphilitica var. ludoviciana may occur sporadically in our area, but is typically found further west. 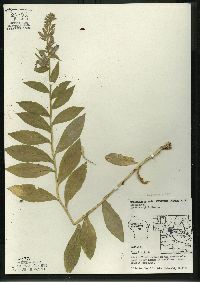 It can be distinguished from the typical species, as described above, by having narrower, hairless leaves, and thin-haired to almost hairless sepals. 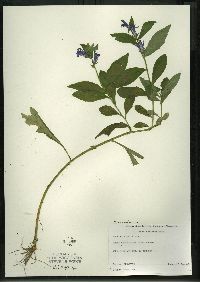 Lobelia siphilitica var. ludoviciana also typically has less than twenty flowers in the inflorescence. Habitat and ecology: Somewhat common in moist ground such as along marshy streams, around pond borders, or in calcareous fens. It is more rare, but not unknown, to find this species along the sandy shores of ponds near Lake Michigan. Notes: Lobelia siphilitica is normally pollinated by bees, and though L. cardinalis is pollinated by hummingbirds, the two species are known to produce the hybrid L. x speciosa. However, this very rarely occurso in nature, presumably due to the differences in pollinators. The ability to hybridize may suggest a close relationship between the two parent species, and one should see Bowden (1982) for more information. Rather frequent in low ground throughout the state in woodland, along roadsides and ditches, and about lakes. Stout, erect, 5-15 dm; lvs thin, narrowly oblong or elliptic to lanceolate or oblanceolate, mostly 8-12 cm, narrowed to a sessile base; racemes crowded, 1-3 dm, the lower bracts lanceolate, foliaceous, to 5 cm, the upper reduced; pedicels ascending, 4-10 mm, bibracteolate at or above the middle; fls 2-3 cm, blue (white), fenestrate, glabrous; sep lanceolate to ovate, 8-12 mm, with foliaceous auricles; 2n=14. Swamps and wet ground; Me. to Man. and Colo., s. to N.C. and Tex. Aug., Sept. The common phase in our range is var. 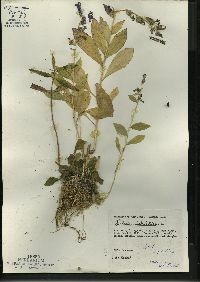 siphilitica, with the herbage, hypanthium, and cal ±hirsute, the lvs mostly 2-6 cm wide, and the fls usually more than 20. The var. ludoviciana DC., glabrous or nearly so, with the lvs seldom over 1.5 cm wide, and the fls 6-20, occurs principally on the Great Plains, extending e. about to the Mississippi R.